Back in June, Joya de Nicaragua announced a new blend to be available at IPCPR 2014. The line was dubbed Joya Red, and was marketed as a bit of a departure for the company in that it would forego the typical high-ligero content often present in their cigars. The Joya Red would be more sedate in potency, yet strive to achieve boldness in flavor. 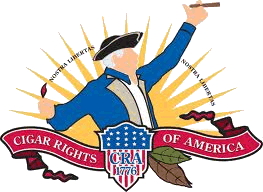 It carries a Nicaraguan Habana wrapper over Nicaraguan binder and Nicaraguan filler from Jalapa, Condega, and Esteli. Four vitolas are available, the Short Churchill (4.75” x 48), Robusto (5.25” x 50), Cañonazo (5.5” x 54), and Toro (6” x 52). Today, I’m taking a look at the Toro, which retails for about $5.50 per stick in boxes of 20 or $7 for singles in the Tampa market. Three examples have been smoked for this review, furnished by Joya de Nicaragua/Drew Estate. The wrapper leaf on the Joya Red is light to medium brown, with consistently even coloration. The complexion presents light to moderate veining and very light oils. I failed to find any anomalies in density, and despite an overall dense feel the draw was near perfect on all three. Pre-light, the aroma on both wrapper and foot was faint and hay like – not unlike some Rattrays’ Virginia blends, for all you pipe smokers out there. The samples I’ve smoked have been generally put together well, as evidenced by the self-correcting burn (to be discussed later) and “goldilocks” draw. There were a few minor defects in the wrapper application and specifically with a split cap on the final example smoked. It appeared the cap had torn while being applied, as it was spread widely across the head (not simply a crack from storage conditions or handling). The cold draw was somewhat nondescript, with fresh hay being the predominant flavor. I would say the same of the pre-light aroma. 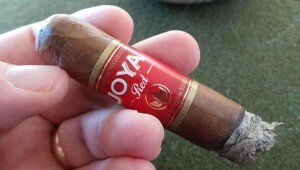 At first puff, the Joya Red provides a bit of spice, but not at especially high levels. In fact, without retrohale you may not even feel it at all. The flavor is leathery and supplemented very nicely by a bit of tangerine sweetness. This largely sums up my experiences during the entire first third of each cigar, with one minor addition of a comment about the burn. This cigar, in all examples, provided a burn that consistently fooled me. Just when I would think it to be wandering out of my comfort zone, it would self-correct into a perfect line. Late in each experience, the Joya Red did require a touchup or two; however, only once did the burn become unruly and venture outside normal expected maintenance. I am still impressed with the blending skill involved to produce such a (mostly) self-healing burn line. Throughout the midsection, I found that the earlier mentioned citrus flavor develops considerably, although it is tempered by no small amount of sweet spice – I likened it to allspice. The sharper spice felt on the retrohale subsided quite a bit by this point, and has been replaced by the underlying leathery quality. The final stretch of the Joya Red delivers a noticeable uptick in strength, and a fading of the earlier sweetness. The flavor morphs into a more tannic profile, and can become very slightly bitter if you don’t mind your cadence. The effect is easily nullified with slowing down the rate at which you are smoking the cigar. The citrus has evaporated by now, and been replaced with a sharper leather predominance, with a somewhat woodsy character. It’s still pleasant, and a welcome deviation from the sweetness. The burn is more problematic than earlier, but still manageable.